Whether snacking on TED-Ed videos, reading with purpose, checking into a smile backchannel, or chuckling at hashtags and memes, you're never far from relief and inspiration. Is the school year winding down? Do you need a reboot to help get through a challenging month? Inspiration can come from many places. From the smile on a student's face, to a great conversation with parents, to an episode of a favorite television show that provides an idea for the next day's lesson, small moments can be game changers when we need to reboot and recharge. When I was a classroom teacher, those days after a long break or in the midst of a period without a moment to catch my breath could make it hard to find inspiration in everyday moments. In this list of resources for teacher inspiration, you'll find a handful of different websites and apps to energize your lesson, lighten your mood, and inspire you to persevere through a challenging part of the school year. These might become part of your daily or weekly routine, or something that you turn to for a dose of inspiration to reboot during a tough time of year. If you've tried one of my favorites or have another to add to the list, share your top resources for finding inspiration in the comments at the end of this post. 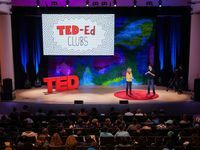 There are plenty of lists of TED talks for teachers who might need a dose of inspiration when times feel tough. One of my favorite resources for teachers is TED-Ed, the classroom-education-focused branch of this organization. Not only will you find lesson ideas and videos to use in your classroom, but the whimsical, often uplifting nature of the clips on this site are perfect for energizing a lesson. These videos can inspire you to look at a tired topic with a new lens and help your students see the purpose behind the content they're studying -- one way to boost interest and engagement. If you're a Twitter user, you know how a hashtag on the end of a tweet can categorize information and make it easy to search on a topic. The #ThankATeacher hashtag is one example of the movement to show teacher appreciation. A quick scroll or a daily search of this hashtag can offer a reminder of how your job leaves a lasting impact on the lives of all those you teach. Although this actor may not seem like an obvious person to include on this list of resources for inspiration, I happen to love the teacher-themed memes associated with his face that you might have spied on your Pinterest stream or Facebook newsfeed. An inspiring quote on the wall might center you during a normal busy day, but it takes something special to turn a frown upside down during a particularly tough time of year. Even with your best effort, it's hard not to smile when you see the quotes playfully attributed to Ryan Gosling. The reaffirming quotes are definitely silly, but might be just the trick to help you snap out of a rough day. A gathering over a shared text can be a great way to turn a venting session into an opportunity to brainstorm how to overcome obstacles. You might pick a piece of light fiction or a professional book (like the ones on Jose Vilson's or Ross Cooper's reading lists). If convincing teachers at your school to join a book club is a challenge, a virtual or online book club is a great option. Reading with a purpose and using a book club guide or discussion questions can help direct teachers to inspirational moments. Start a schoolwide meeting with a smile backchannel using a web tool like Padlet or TodaysMeet. Ask your fellow educators share one thing (or more) that made them smile that day, or something that they did to make someone else smile. This quick activity can set a positive tone for group discussions, PLC meetings, or faculty groupings. This is especially helpful for whole-staff meetings that might feel low energy. At the end of the meeting, revisit this page to leave on a positive note -- reminding your staff of the impact that they have, both big and small, every day. Inspiration can come in many forms, sometimes when we least expect it. Although today might be a day when an uplifting moment seems light years away, this list of resources can help elevate your mood, energize a lesson and connect you with like-minded educators. Add your inspiring stories and favorite resources to the comments below.